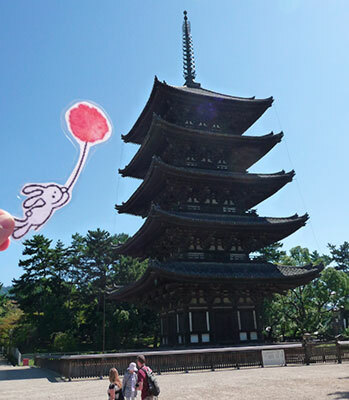 Luckily, Brave Squish Rabbit managed to escape the scary city of Nara. 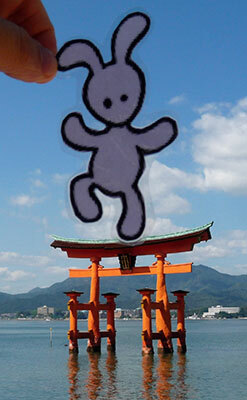 He was so excited to visit Miyajima that he climbed up and danced on top of one of Japan’s most sacred Torii gates. Fortunately, he managed to elude police when he finally came down. Naughty Squish Rabbit! 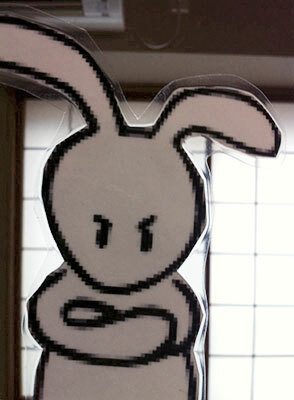 Brave Squish Rabbit very quickly developed an addiction to Taito Station, a Japanese games arcade. 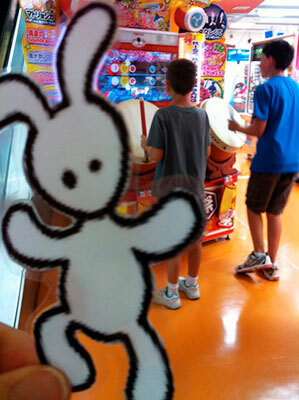 In particular, he couldn’t get enough of the “Kiss Kiss Bang Bang” drumming game. Best fun you can have for 400 yen! 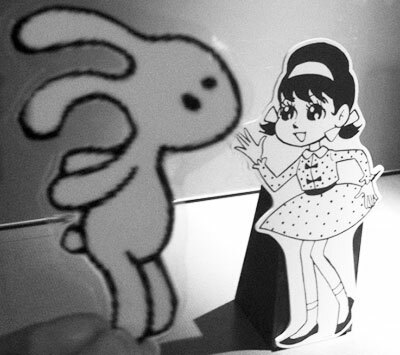 And now, in his bravest move yet – yes, braver than facing chickens or going back to Nara – Squish Rabbit will head to Tokyo! 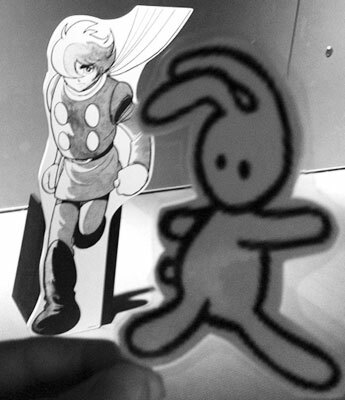 … but, unfortunately, he got distracted. 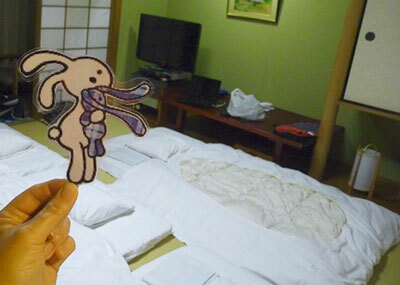 Squish Rabbit’s trip to Japan had been WONDERFUL! He did NOT want to go home. But then he remembered the toilets. And Nara. So he crawled into his futon (“It’s on the ground, but it’s not a burrow,” he said. “It’s not a bed either, but it’s goooood!”) and got a good night’s sleep before his trip back home. “Sayonara,” he said. And then Brave Squish Rabbit made it all the way home before his bladder burst. Ah, Squish. Can I say how jealous I am? I’ve been wanting (desperately) to go to Japan for years, as I’ve had a long time love affair with all things Japanese. Their food, their culture and mindful traditions, their wonderfully finicky politeness, their clean design aesthetic, their animation (I want to live in the worlds of Miyazaki), their writings (oh to create characters like Murakami) and their art (Yoshitomo Nara does the best angry children).